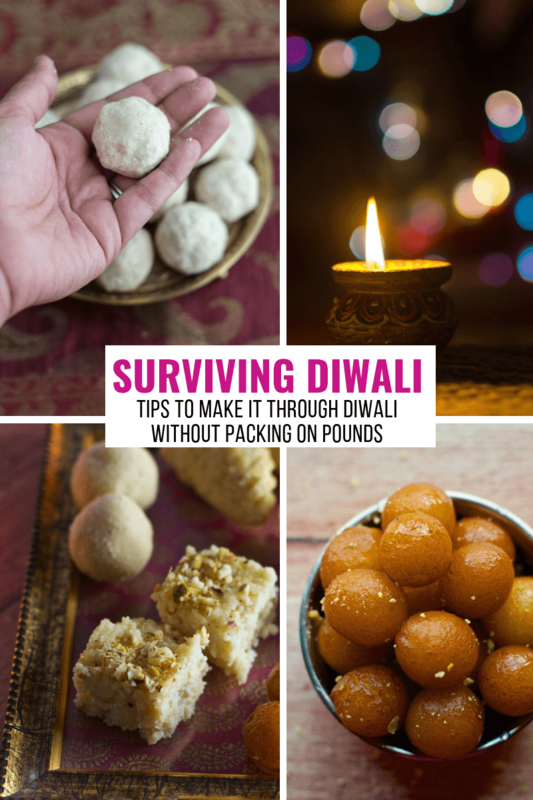 Here’s a short and sweet article on how to survive Diwali without packing on pounds. Are you excited about Diwali (and nervous too), just like I am? Isn’t this what we do during Diwali? – Wake up really early; start churning out sweets and in the process forget to eat until it is almost lunchtime! Then we are ravenously hungry and eat everything in sight. That is not all.. We spend the coming weeks eating leftover sweets and before you know it – those yummy cookies, pastries, and chocolates have hit the grocery stores to welcome Thanksgiving and Christmas season. And then there is no stopping us – :-(. By the time New Year hits, we are all shuddering to look at the weighing scale and trying to google up how to lose weight. What can we do so that we don’t have to think of or worse go through a detox or a diet program after the holidays? I am sure there is a way that will allow us to enjoy our sweets and not gain oodles of weight. This is what I followed last year and it worked well for me and I thought of passing it along. Eat every 2 hours and drink lots of water. I have noticed that if I do that I don’t crave sweets as much. I was able to skip eating Tiramisu that I made recently which wouldn’t have been possible before. Follow Rujuta’s “Rule of Pi” which states that one must exercise once out of 3.14 days. When you have worked so hard on your exercise routine you’ll not feel like indulging in sweets! Take rest – Don’t kill yourself trying to make ten different varieties of sweets. Decide for yourself how many do you really need to make – pick one favorite per family member. And if your neighbor shows off her collection off sweets, ignore her – say good for you and move on. Sharing is caring – Share some love and sweets with your friends that way you are not stocking it up. Eat before you hit the sweet store – That way you are less likely to splurge on sweets. Eat a fruit or something healthy before a party – That way you’ll not be ravenously hungry by the time you reach your destination and don’t want to eat every appetizer in sight. Don’t hate yourself for indulging – Last but not the least, remind yourself that it is Diwali – a time to enjoy with family and friends and share food, sweets and make memories.. not a time to GUILT yourself over an extra sweet you ate. and to keep you motivated to check out this old yet relevant article on Gentle reminders for a night of light. So are you ready to form some new habits?– eating every 2 hours, drinking lots of water and exercising. Let me know your story of how you survived Diwali. Keep me posted through my Facebook site.